This post contains affiliate links. I was sent the book for free to review by America's Test Kitchen, but am not being compensated. I don't hide the fact that I'm not a baker. When I first began blogging I did a lot of substituting, using natural sweeteners and non-dairy, lower-fat swaps. The results to those experiments are fine to eat at home, but not anything I'll serve guests. Why subject them to something that is bland, rubbery, and screams "Hi, I'm nothing like the real thing! Just want to remind you by being super lame." America's Test Kitchen is now my baking mentor. I have a lot more respect for what goes into my oven, and know that there is a real science that goes into every recipe. You can't always just switch out an ingredient - or a pan size, or even the material of the baking vessel. Their latest cookbook, Naturally Sweet, is a collection of dessert recipes (frozen too!) that contain natural sweeteners and less sugar. Basically, they are doing all of the hard work for us - testing and perfecting everything so we don't have to start swapping and guessing. They even send me a package of Sucanat to get my bake on. Sucanat stands for "SUgar CAne NATural" - and is the least refined cane sugar (outside of a cane stalk). It is equally sweet to sugar, but has all the nutritional benefits of molasses (calcium, magnesium, and potassium). I am bringing some of their Pumpkin Bread to a friend's house - it's a no-brainer since it's fall and (almost) everyone loves it. I resist the temptation to add chocolate chips and follow the recipe step-by-step. With one exception - I leave out the walnuts, because I am weird about nuts in my desserts. 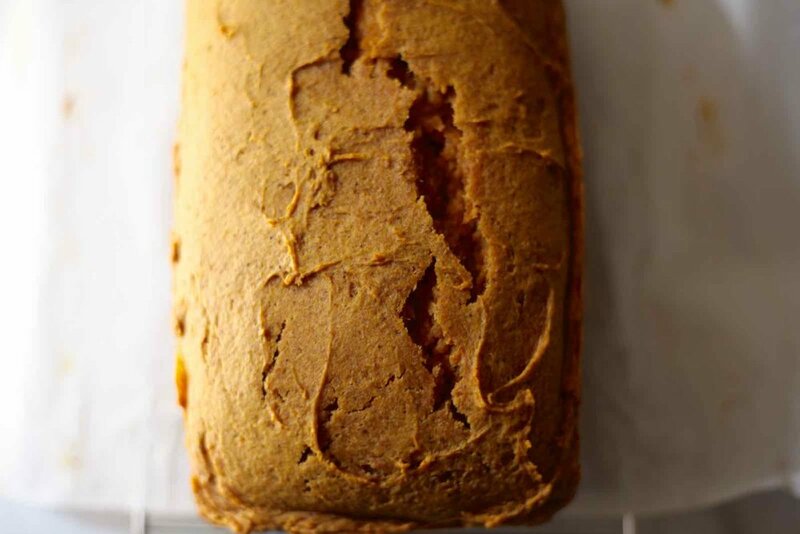 It is a little more involved than your typical Pumpkin Bread Recipe. 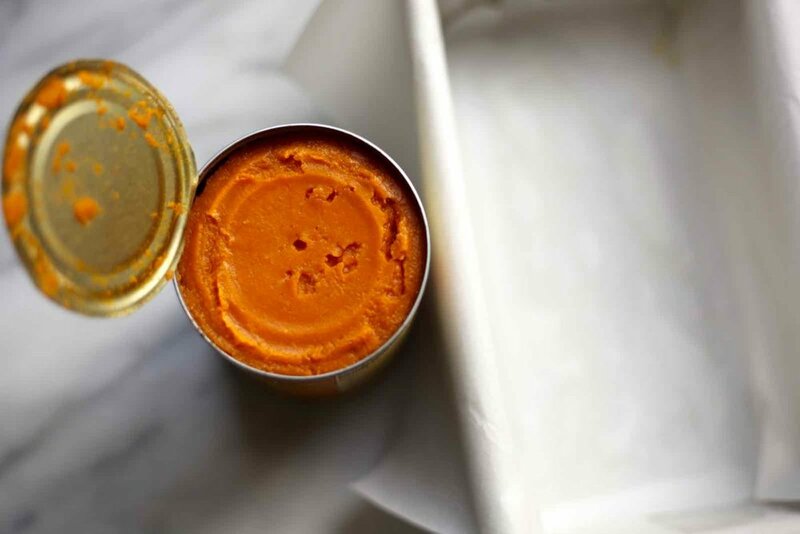 Because there is less sugar, you have to cook down the canned pumpkin puree to concentrate the sweetness. This step also involves blooming the spices, resulting in a much more "THIS IS PUMPKIN BREAD" flavor. It uses buttermilk (not an ingredient I typically have on hand) and cream cheese to combat dryness. And how does it taste? 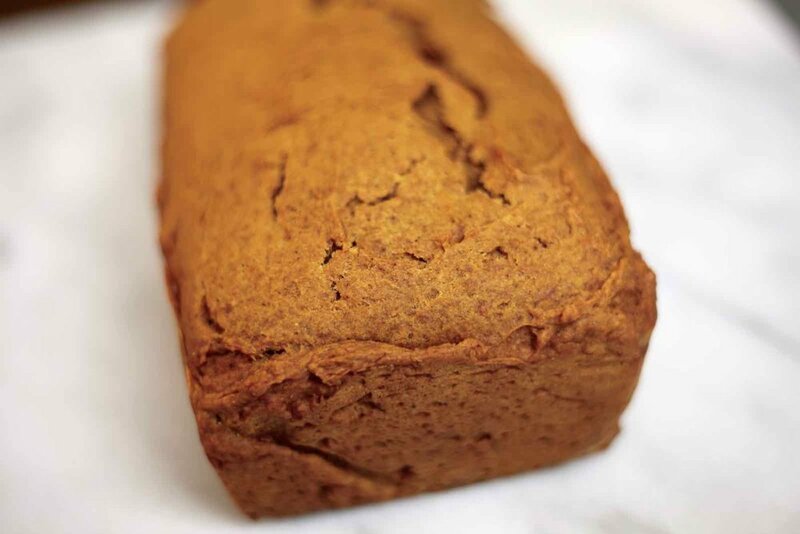 Like the pumpkin bread you imagine waking up on a farm and eating - super fresh and simple. Not the overly-sweet cafe style slice doused in a glaze and drowned with a pumpkin spice latte. With a smear of a little more cream cheese, this can become the star substitute for Sunday Bagel Brunch, fall through winter. Recipe reprinted with permission from America's Test Kitchen. Contains 11 grams of sugar, reduced from 24 grams of sugar in the typical pumpkin bread recipe. Preheat oven to 350 degrees. Grease a 8 1/2 by 4 1/2 inch loaf pan. Whisk flour, baking powder, and baking soda together in a bowl. Combine pumpkin puree, ginger, salt, nutmeg, and cloves in a large saucepan. Cook mixture over medium heat, stirring constantly, until reduced to 3/4 cup, 6-8 minutes. Off heat, stir in Sucanat, oil, and cream cheese. Let mixture stand for 5 minutes, then whisk until smooth and no pieces of cream cheese remain. Whisk eggs and buttermilk together, then whisk into pumpkin mixture. Using rubber spatula, fold in flour mixture until just combined (some small lumps of flour are OK). If using walnuts, fold them in. Scrape batter into prepared pan and smooth top. Bake until toothpick inserted in center of the loaf comes out clean, 50 minutes to 1 hour. Rotate pan halfway through baking. Let bread cool in pan for 20 minutes, then transfer to a wire rack and let cool for at least 1 1/2 hours before serving. If using a 9x5 loaf pan, start checking for doneness 5 minutes earlier than advised. If using Coconut Sugar, use 3/4 cup (3 1/2 ounces). If using Granulated Sugar, use 1/2 cup (3 1/2 ounces). Full disclosure: ATK is providing this copy of Naturally Sweet to review but I am not receiving compensation. All opinions are my own.